Our objective in this paper has been to evaluate the ability to disentangle the differences of visual ERPs generated by facial stimuli (Anger & Fear) as well as the cognitive deterioration of Subjective Cognitive Impairment (SCI), Mild Cognitive Impairment (MCI) and Alzheimer’s Disease (AD) compared to Healthy Controls (HC), as measured by the N170 event-related component (ERP). Fifty seven participants (N=57) participated in this study. Images corresponding to two negative facial stimuli “Anger” and “Fear” were presented to 12 Healthy Controls (HC), 14 with SCI, 17 with MCI and 14 with AD participants. 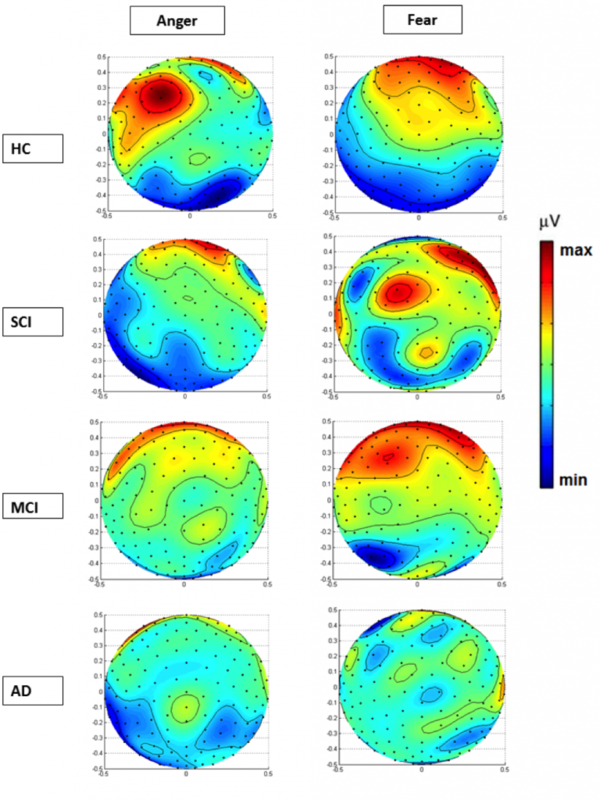 EEG data were recorded by using a HD-EEG HydroCel with 256 channels. The results showed that the amplitude of N170 can contribute in distinguishing the SCI group, since statistically significant differences were observed with the HC (p< 0.05) and the MCI group from HC (p< .001), as well as AD from HC (p= .05) during the processing of facial stimuli. Despite the small sample size and the within group variability observed for each cohort, there are clear pieces of evidence on the potential of using the amplitude of N170 to create a bio-marker distinguishing SCI from the groups of MCI, AD and HC. As expected, in the case of AD group the amplitude of the negative N170 peaks was far larger than all the others, however this was also the case with the variability observed in this group. Moreover, positive correlations were observed between specific neuropsychological tests and the amplitude of N170 in the case of “Fear”. Noticeable differences were also observed in the topographic distribution of the N170 amplitude; while localization analyses by using sLORETA images confirmed the activation of superior, middle-temporal and frontal lobe brain regions. Finally, in case of “Fear”, SCI and HC demonstrated increased activation in Orbital and Inferior Frontal Gyrus respectively, MCI in Inferior Temporal Gyrus and AD in Lingual Gyrus. The conclusion that can be drawn from these preliminary findings suggests that the amplitude of N170 elicited after negative facial stimuli could be modulated by the decline related to pathological cognitive aging and can contribute in distinguishing HC from SCI, MCI and AD.